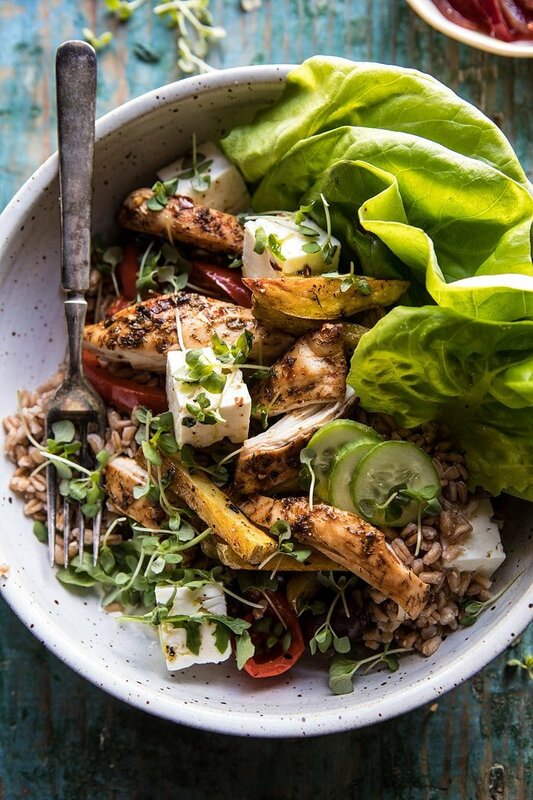 Keeping Thursday fun and colorful with this Roasted Greek Chicken and Farro Salad with Oven Fries. Here’s the thing, I love salad, but salad with iceberg lettuce and weird dressing? No, I do not love that kind of salad. Whenever I make salads, I make them big, colorful, full of different veggies, and I always finish them off with cheese. Always. Today’s salad is just that. 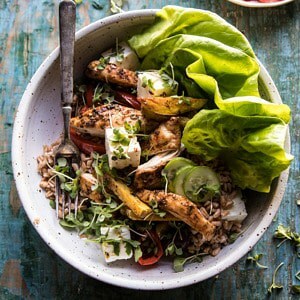 It’s packed with whole grains, roasted chicken, veggies, homemade tzatziki, feta cheese, and topped with a simple red wine vinaigrette. There is nothing boring about it. 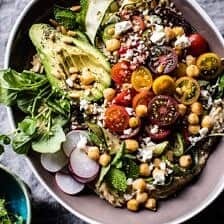 I feel like people tend to forget about salads during the winter months, but with a few adjustments, you can make them great. 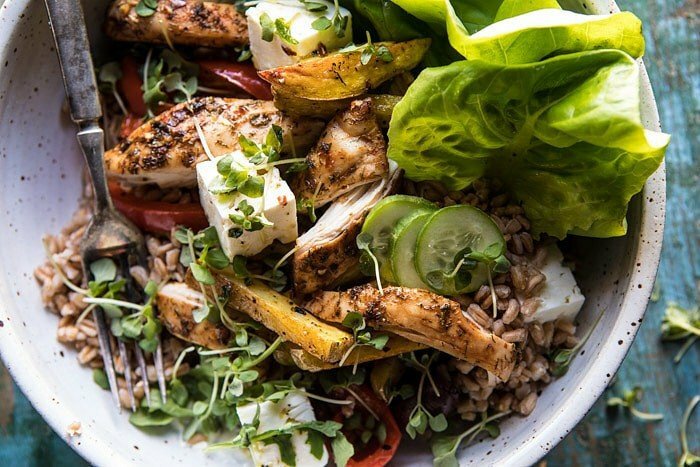 The inspiration for this salad actually came from my sheet pan Greek chicken. In less than a year, that chicken recipe has been loved by so many. It’s easy, healthy, and delicious. Since I too love that recipe, I wanted to give it a new spin. I brainstormed a few different ideas, but in the end this salad was top on my list to create. It just sounded so good…bright and cozy, the perfect winter salad. It can lead into us into warmer spring days…which I will most likely be very ready for once I return from cold South Korea. Unlike most salad recipes, this salad starts out by roasting chicken and making the fries. Because this is more of a winter salad, I wanted some elements of the salad to be warm. 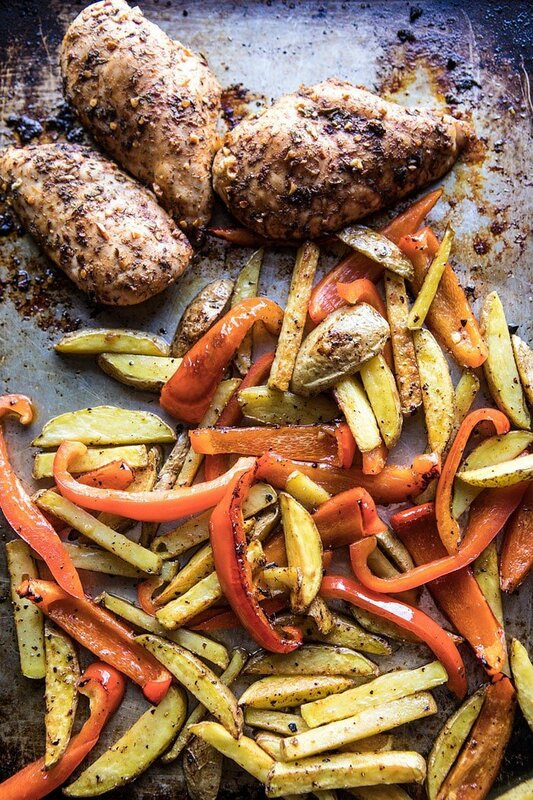 I roasted the chicken, fries, and bell peppers all on the same sheet pan to make this simple and easy. Now I know fries in a salad might sound odd, but this is something my dad used to do with his salads, and I’ve loved doing the same ever since. I’m sure I’ve mentioned this before, but when I was growing up my dad would make salad for himself every single night. Well, I am not sure it was really a salad, but it always had lettuce, so I called it a salad. He would throw whatever was in the fridge or pantry into a bowl, add lettuce, and dressing and call it dinner. I guess he did this because he didn’t want the usual chicken and rice that he fed my brothers and I. Which is pretty understandable, it was kind of boring. Long story short, dad used to throw the leftover oven fries that he would make for us into his salads. 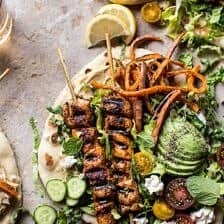 For the longest time I thought that adding fries to salad was just the normal thing to do, but as I got more into cooking, I realized it was actually a rather unique salad topping. If you’re new to this whole fries in a salad thing, you should know it’s the best topping, and you really should give them a try. They’re perfect when making a big hearty dinner salad. Preferably this salad because it’s truly one of the best. Once you have the chicken and fries roasted, the salad comes together pretty quickly. 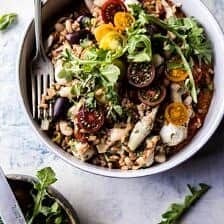 I used farro as my grain, but you could really use any leftover grains you have on hand. Quinoa and brown rice would also be great. Add some feta and a light drizzle of vinaigrette and your salad is done. 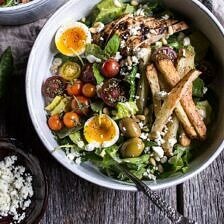 Additionally, this is a great salad to prepare on Sunday, for quick lunches or easy dinners throughout the week. Everything keeps really well once tossed together and the flavors get even better over time. The only thing that I would add just before serving would be the lettuce. You could even throw in an avocado as well, avocados are always a good idea. 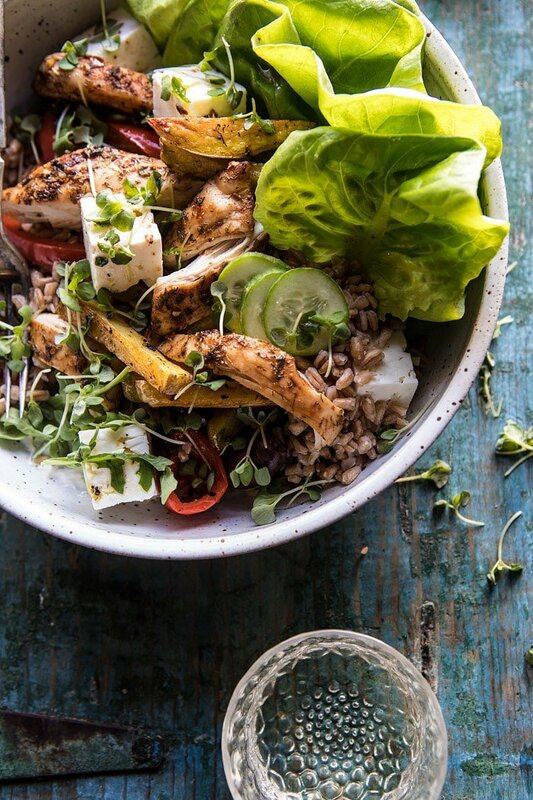 Roasted Greek Chicken and Farro Salad with Fries. 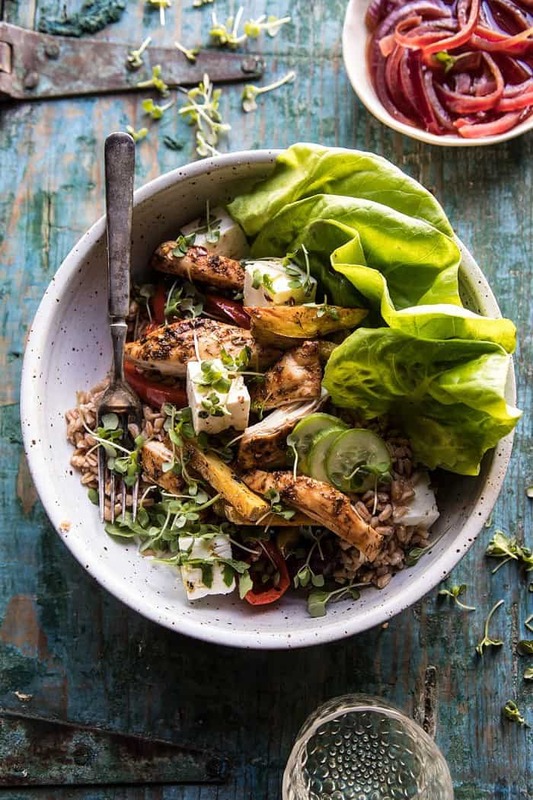 Packed with whole grains, roasted chicken, veggies, homemade tzatziki, feta cheese, and finished with a simple red wine vinaigrette, there is nothing boring about it! 2. 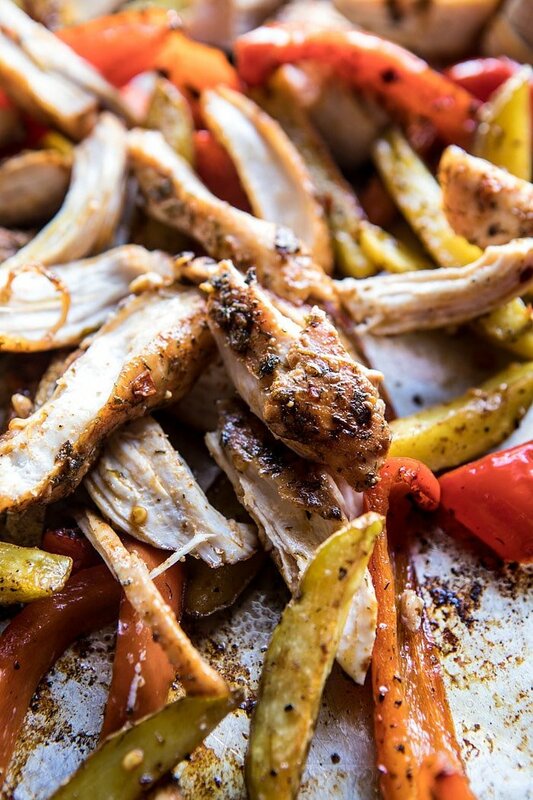 On a rimmed baking sheet, combine the chicken, 1 tablespoon olive oil, the balsamic vinegar, dill, oregano, paprika, garlic and a large pinch of both salt and pepper. Toss well to evenly coat the chicken. Add the potatoes, and bell peppers, and toss with the remaining 1 tablespoon olive oil and a pinch of both salt and pepper. Arrange everything in an even layer. Roast for 40-45 minutes, tossing halfway through cooking until the chicken is cooked through and the potatoes golden. Let the chicken cool slightly and then shred into chunks. 3. To assemble: smear a little tzatziki into the bottom of 4 salad bowls. Add the farro, lettuce, bell peppers, potatoes, and chicken. Sprinkle the feta and top as desired with olives, cucumber, and red onion. Drizzle with the red wine vinaigrette (recipe follows). 1. Combine all ingredients in a bowl or glass jar. Whisk well to combine. Taste and adjust seasonings as needed. The prettiest, brightest winter salad. I’m a sucker for oven fries, addicted to them more like. Aren’t they just the best?! Thanks Ruth!! Looks like a great salad. Love salad for dinner. 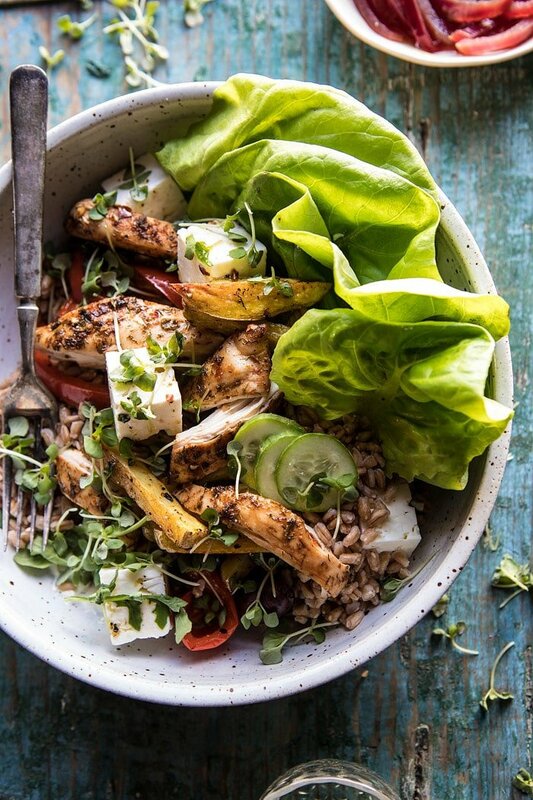 Fries and roast chicken in salad. It’s like we’re salad soul sisters! Haha so glad you like this! Thank you Debs! Farro dishes are my favorite Tieghan. So nice and hearty. And add those fries and it’s even heartier. Great list of ingredients! This is loaded with so many delicious things! Looks incredible! Sounds absolutely delish! Love Greek-inspired recipes. I made this for supper tonight and my whole family loved it. Yum yum yum. Fries in salad…genius! That could seriously be the greatest salad I’ve ever seen! This looks fantastic–I think I’ll make it for dinner tonight! I know you’re originally from the Cleveland area (I’m originally from Youngstown! ), but did you know that putting fries on salad is totally a Pittsburgh thing? What a perfect meal for any night of the week! How is it that people forget about winter salads? I really love them. This one looks so flavorful and delicious! Such a gorgeous meal and just what I’m craving for Friday night dinner! YUM! I actually texted my boyfriend this recipe to make while I worked a late night (he is not a cook so this is usually a risk) but it seemed easy enough and I came home to a delicious meal! He was so proud of his handy work and I was so appreciative that the recipe was easy to follow and didn’t have a ton of steps. Thanks for all the inspiration, healthy foods, and yummy flavors. I can’t wait to watch for your brother at the Olympics! Thank you Libby! I am so glad you enjoyed this recipe! I made this roasted greek chicken and farro salad with oven fries, but didn’t have any feta. I had Paneer cheese and a few slabs of bacon so I fried up the bacon and sliced it into small chunks and threw that on top of the salad. Then fried the paneer cheese in the bacon fat and threw that on top. The paneer doesn’t melt so it maintains its shape. Sooo good.